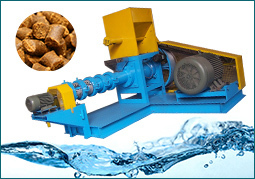 Fish feed extruder, a high-temperature short-time bio-reactor, can transform a variety of raw ingredients into pellets for production of healthy wholesome fish feed. It is one of the prominent developments in fish farming, which contributes to the huge step forward in aquaculture. Fish feed extruder is designed and fabricated generally including a hopper, barrel which houses the screw conveyor, the cutting knife, the die and etc.. Power supply to the machine is often the electric motor. Fish feed extruder is increasingly popular in fish farmers and there are various extruders with slightly different designs for fish feed production in the market. 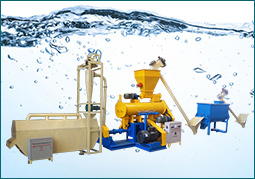 Here let’s understand various of fish feed extruder designs. Depending on the number of screw in the extruder barrel, fish feed extruder can be divided into single screw extruder and twin-screw extruder, which are both widely applied in aquafeed production. 1. Single-screw extruder: as its name implies, single screw extruder contains only one screw and is featured with simple structure. Single-screw extruder is applied in aquafeed production for over 40 years, it is easy to operate and minimal training required for the operators and the operation performance is relative stable and reliable. Generally single screw extruder is utilized for making feed pellets for small and medium scale. 2. Twin-screw extruder: Twin-screw extruder is with two screws of equal length placed inside the same barrel, which develops on the basis of single screw extrusion machine. More complicated than single screw extruder, twin-screw extruder is marked by its wide adaptability, flexibility, better control and etc.. Compared with single-screw extruder, twin-screw extruder is relatively expensive due to the high primary investment and operation and maintenance costs. Operators need to be very careful when assembling a new configuration. Thereby twin screw extruder is often used to produce value-added feed pellets in the high demanding aquaculture. All in all, single screw extruders are more practical to operate than twin-screw extruders, while twin screw extruders are more advanced and more extensive use of performance than single screw extruders. To opt the suitable one depends on the production requirement. Single-screw design has two types of fish feed extruders: dry type fish feed extruder and wet type fish feed extruder. The big difference between the “dry” and the “wet” extruder is: a dry extruder does not require an external source of heat or steam for injection or jacket heating that required by wet feed extruder. 1. Dry extruder is the single screw extruder with screw segments and steamlocks on the shaft to increase shear and creating heat. In dry extursion process, all the heat produced is generated by the friction and mechanical energy. So dry fish feed machine requires relatively low capital investment and can be designed to fit all sizes and types of installation. Less training is required for workers’ operation. It’s suitable for processing low moisture and high fat feed material. 2. 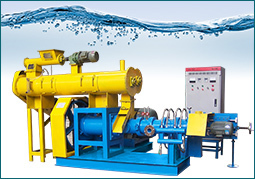 Wet type extruder is the more complicated machine compared with dry extruder. It is featured with precision metering systems for steam or water injection into either the conditioner and/or the extruder barrel. Preconditioning is a very vital step in wet extrusion process for chemical or physical reactions to take place. Compared with dry extruder, we type fish feed machine has a higher capital investment but lower operation cost. Wet type extruder has larger capacity and is capable of producing superior final feed products, so it is suitable for large scale and high demanding feed production. Dry type single screw fish feed extruder does not need the steam boiler, so it is cheaper and easier compared with wet extruder. Due to practical and economical merits, dry type extruder is favored by farmers in the market. 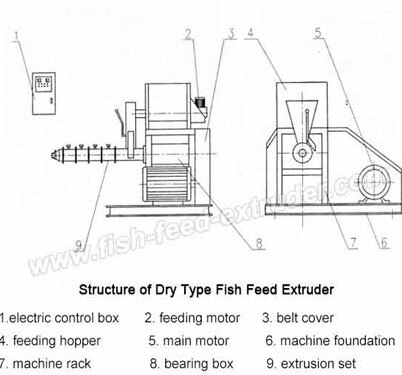 Here is detailed design analysis of dry type fish feed extruder. The main frame of dry extruder mainly includes the feeding system, extrusion system and main electric power motor. There are three parts in feeding system: feed hopper, feed screw and feed mixer. ♦ Feed hopper: it is the part in which feed materials prepared before extrusion stage. ♦ Feed screw: the screw is fixed in the bottom of the feed hopper to transmit materials form feed system to extrusion unit. ♦ Feed mixer: it is working inside the middle of feed hopper to evenly mix and turn the materials. 2. Extrusion system: it is responsible for compressing and cooking materials before going into the forming zone. ♦ Extruder screw: the screw is positioned inside the barrel. Both of screw and barrel are made of alloy steel. Through thermal treatment, they are featured with good wear resisting and long service life. 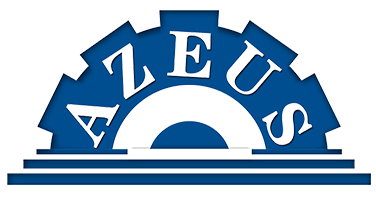 The general extrusion process involves a high temperature over a short time. Temperature higher than 100℃ is needed in order to achieve expansion of the feed as it leaves the die. The high temperature in dry extrusion is acquired through dissipation of mechanical energy from heated surfaces such as barrel and screw surface, or generated by shear forces between wall and material and screw and material. Moreover, high temperature and high pressure process can kill the salmonellosis and bacterial infections and also makes the pellets easily to digest. ♦ Die hole entry: the entry is of conical shape to help materials to easily flow inside the effective holes. ♦ Die: it provides restriction to product flow causing the extruder develop the required pressure and shear. Different molds can be chosen to make pellets with different diameters and shapes. ♦ Cutter knife: internationally advanced cutting technology. It consists of sharp blades. It rotates in a circular motion on die surface, which is used to cut the final products into small parts. The final pellet length can be controlled by changing knife speed. 3. Electric power system: main motor, feeder motor and cutter motor.